NETWORK FINALS: Because of the many sports preemptions on Thursday night, our full broadcast network analysis is below. ABC: The season finale of BOY BAND was up 0.1 to 0.6, but both BATTLE OF THE NETWORK STARS and the rerun of THE GONG SHOW were down 0.1 to 0.5. CBS: BIG BROTHER fell 0.4 from last Thursday to 1.7, and ZOO was down 0.2 to 0.4. The night began with 1.1/0.9 reruns. NBC: THE WALL slipped 0.1 to 0.8, and the final summer Weekend Update edition of SATURDAY NIGHT LIVE was up 0.1 to 1.3. After a rerun of GREAT NEWS at 0.6, THE NIGHT SHIFT rose 0.1 to 0.7. FOX: BEAT SHAZAM (0.7) and LOVE CONNECTION (0.6) were steady. CW: PENN & TELLER: FOOL US (0.4), the new WHOSE LINE IS IT ANYWAY (0.3) and the rerun (0.3) all held last week’s ratings. CABLE HIGHLIGHTS: Tru’s IMPRACTICAL JOKERS took Thursday cable, up 0.02 to 0.50, with the lead-out AFTER-PARTY up 0.03 to 0.30. NFL Network’s Preseason game was at 0.44. 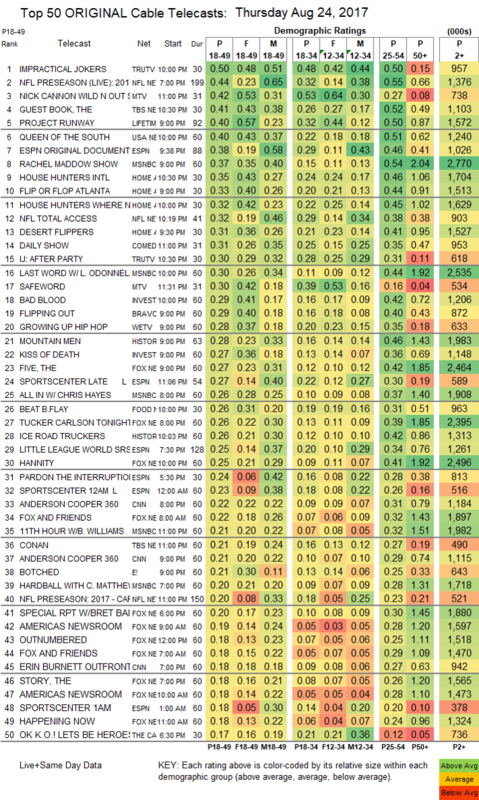 On MTV, WILD N OUT rose 0.02 to 0.42, and SAFEWORD was up 0.06 to 0.30. TBS’s THE GUEST BOOK ticked up to 0.41. Lifetime’s PROJECT RUNWAY declined 0.04 from last week’s season premiere to 0.40. USA’s QUEEN OF THE SOUTH slipped 0.02 to 0.40. ESPN’s coverage of the LITTLE LEAGUE WORLD SERIES was at 0.25, with a lead-out 30 FOR 30 documentary at 0.38. In cable news, MSNBC’s RACHEL MADDOW SHOW held the lead at 0.37/2.8M, with Fox News’s THE FIVE at 0.27/2.5M, and CNN’s ANDERSON COOPER 360 at 0.22/1.2M. On HGTV, HOUSE HUNTERS INTL gained 0.02 to 0.35, FLIP OR FLOP grew by 0.03 to 0.33, HOUSE HUNTERS: WHERE ARE THEY NOW was at 0.32, and DESERT FLIPPERS was steady at 0.31. On ID, BAD BLOOD ticked down to 0.29, and KISS OF DEATH debuted at 0.27. On Bravo, FLIPPING OUT remained at 0.29, and GIRLFRIENDS GUIDE TO DIVORCE was up 0.02 to 0.14. We’s GROWING UP HIP-HOP rose 0.03 to 0.28. On History, MOUNTAIN MEN was at 0.28, and ICE ROAD TRUCKERS returned at 0.26. Food Network’s BEAT BOBBY FLAY dropped 0.03 to 0.26. 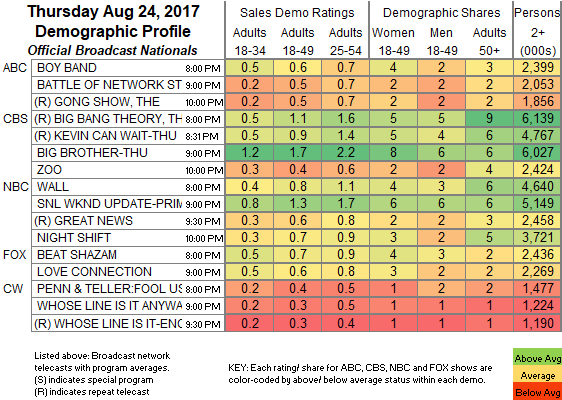 E!’s BOTCHED fell 0.07 to 0.21. Comedy Central’s THE PRESIDENT SHOW was at 0.14. The season finale of Spike’s THE MIST ticked up to 0.13. CMT’s DALLAS COWBOYS CHEERLEADERS ticked up to 0.12. The season finale of Discovery’s FIRST IN HUMAN was steady at 0.10. POP’s IMPACT WRESTLING lost a tick to 0.06.